Photo from: http://www.arc.ab.ca/crop/weed/Weed.html#CARV, Dr. Alec McClay, Crop and Plant Management Unit Biological Control of Weeds using Insects and Mites Alberta Research Council, Vegreville, Canada. 1) Breitenfeldt, Todd, Personal Interview, Biology teacher, Whitehall Schools, Box 1109, Whitehall Mt 59759. (406) 287-3862. 9-2-99. 2) Rees, Norman, et. al., Ed., Biological Control of Words in the West, Western Society of Weed Science in cooperation with USDA ARS, MT Dept. of Ag., and MT State University, Color World printers, Bozeman, MT, Feb., 1996. 3) Beck, K.G. "Canada thistle". 9-Jun-06, 4-Mar-07. <http://www.ext.colostate.edu>. 4) Swearingen M. Jil. Thunhorst, Gwendolyn. "Canada thistle" 27-Jun-06. 3-Mar-07. <http://www. nps.gov>. 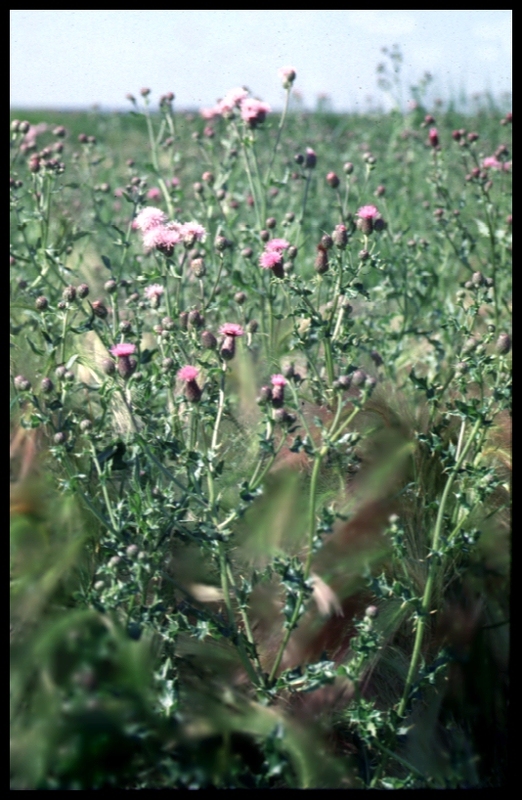 5) "Canada thistle". 23-Jan-04. 3-Mar-07. <http://www.imp.ucdavis.ued>. 6) Hutchison,Max. "Canada thistle". 6-Feb-90. 3-Mar-07. <http://www.inhs.uius.gov>. 7) "Canada thistle". 1-Nov-90. 4-Mar-07. <www.state.sd.us/DOA/das/canada.html>. 8) Larimer County Colorado. 3-Mar-07. <http://www.co.larimer.co.us>. 9) University of Nevada. Cooperative Extension. 3-Mar-07. <http://www/unce.unr.edu>. By: Amber Housman. Published by: Homer R. McKinney. Updated by: Clay Sacks 3/2007.